The zipped folder contains a R script, an executable programmed in Delphi, MATLAB files, ModelMaker files and Mathematica implementations of GUTS. This software is made available under the GNU General Public License 3.0. The software contains errors and bugs. We do not accept liability or responsibility for any damage or costs incurred as a result of these errors. More information on GUTS, including Matlab code, can be found on Tjalling Jager's website. Furthermore there is also a GUTS r-package available. Short presentation about GUTS, prepared by Tjalling Jager. 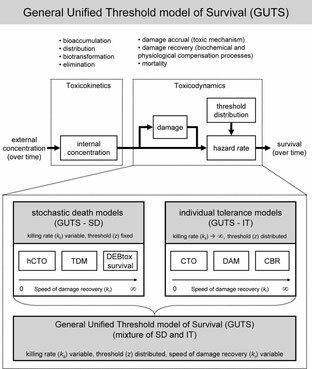 Toxicokinetic-toxicodynamic (TKTD) models quantify the time-course of internal concentration, which is defined by uptake, elimination and biotransformation (TK), and the processes which lead to the toxic effects (TD). TKTD models show potential in predicting pesticide effects in fluctuating concentrations, but the data requirements and validity of underlying model assumptions are not known. 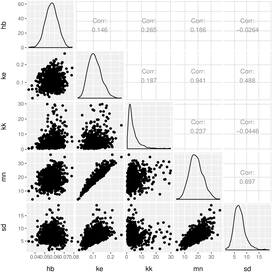 We calibrated TKTD models to predict survival of Gammarus pulex in propiconazole exposure and investigated the data requirements. In order to assess the need of TK in survival models, we included or excluded simulated internal concentrations based on pre-calibrated TK. Adding TK did not improve goodness of fits. Moreover, different types of calibration data could be used to model survival, which might affect model parameterization. We used two types of data for calibration: acute toxicity (standard LC50, 4 d) or pulsed toxicity data (total length 10 d). The calibration data set influenced how well the survival in the other exposure scenario was predicted (acute to pulsed scenario or vice versa). 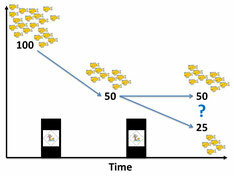 We also tested two contrasting assumptions in ecotoxicology: stochastic death and individual tolerance distribution. Neither assumption fitted to data better than the other. We observed in 10-d toxicity experiments that pulsed treatments killed more organisms than treatments with constant concentration. All treatments received the same dose, i.e. the time-weighted average concentration was equal. We studied mode of toxic action of propiconazole and it likely acts as a baseline toxicant in G. pulex during 10-days of exposure for the endpoint survival. 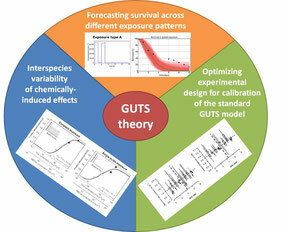 The General Unified Threshold model of Survival (GUTS) provides a consistent mathematical framework for survival analysis. However, the calibration of GUTS models is computationally challenging. We present a novel algorithm and its fast implementation in our R package, GUTS, that help to overcome these challenges. We show a step-by-step application example consisting of model calibration and uncertainty estimation as well as making probabilistic predictions and validating the model with new data. Using self-defined wrapper functions, we show how to produce informative text printouts and plots without effort, for the inexperienced as well as the advanced user. The complete ready-to-run script is available as supplemental material. We expect that our software facilitates novel re-analysis of existing survival data as well as asking new research questions in a wide range of sciences. In particular the ability to quickly quantify stressor thresholds in conjunction with dynamic compensating processes, and their uncertainty, is an improvement that complements current survival analysis methods. PLoS Comput Biol 12(6): e1004978.